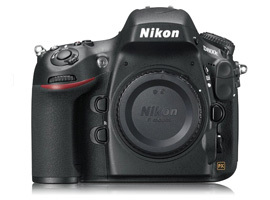 As a derivative of the standard full-frame 36-Mpix D800 the D800E varies only by its modified AA filter. Although the two models share the same full-frame CMOS sensor with an enormous pixel count, the D800E adopts a slightly modified version of that found in the D800. In the standard D800, the low-pass filter consists of two layers of bifringent crystalline material at 90-degrees to each other – the first attenuates high frequency light in one plane and the second does the same in another, reducing high frequency signals slightly – enough to reduce a percentage of erroneous signals that result in moiré and false color. The big question of course is just how much difference is there in resolution between the two models? We’ve tested the optical quality of 100 different lenses on the cameras to see, first, just how much difference there is in sharpness between the two cameras and, second, to determine which are the best lenses to complement the D800E. Although the Zeiss Otus is a significantly better performer on the D800E than the Zeiss Sonnar 55mm f1.8 is on the Sony A7R, the gains are mostly in sharpness. The Otus has better control of distortion and chromatic aberration but it’s also far sharper across the field than the Sonnar at their respective maximum apertures. Both models are outstanding performers yet, even when stopped down, the smaller Sonnar cannot improve on the performance of the Otus. Both lenses are excellent performers but, while the premuim asked for the Otus is high, it has siginificantly higher sharpness across the field on the Nikon D800E than the smaller autofocus Sonnar on the Sony A7R. From our extensive tests the Nikon D800E is, unsurprisingly perhaps, sharper than the standard D800 but it’s heavily dependent on the lens in use. The very best quality lenses are of course capable of conveying the highest detail to the surface of the sensor while the differences in the filter-pack account for the attenuation between the standard D800 and the modified D800E. The maximum difference amounts to a 30% increase in sharpness. For example, with the Zeiss Apo Sonnar T* 2/135 ZF.2, that lens is capable of attaining the maximum resolution from the D800E while on the D800 it’s the equivalent of a camera in the 28-Mpix range. In reality these are peak figures where optimum performance is achieved, and so image sharpness will still vary across the field and differ at various aperture settings. But there’s no doubt, with the right lens the D800E is capable of rendering significantly more fine detail than the D800. What’s more interesting, arguably, is how different lens models perform. 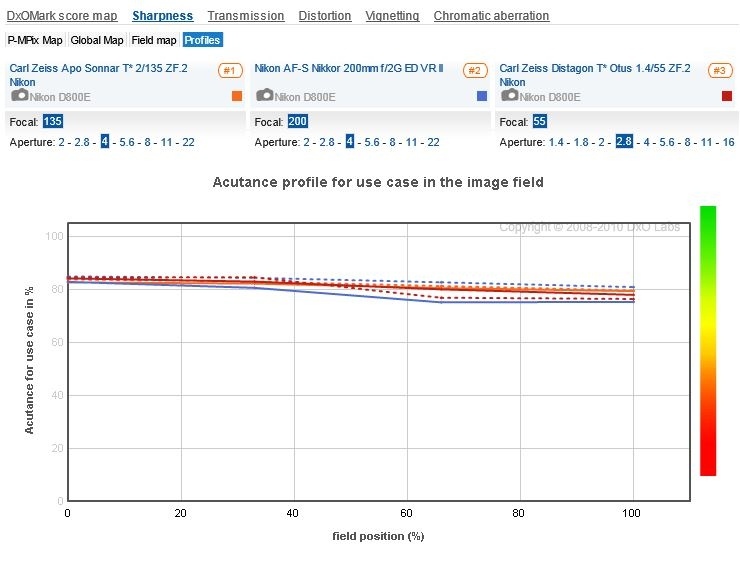 We can see from the above chart that the sharpest model on the D800E is the Zeiss Apo Sonnar T* 2/135, but what’s particularly surprising is the sharpest lens on D800, the Zeiss Otus 1,4/55 can’t quite match its sibling on the D800E. 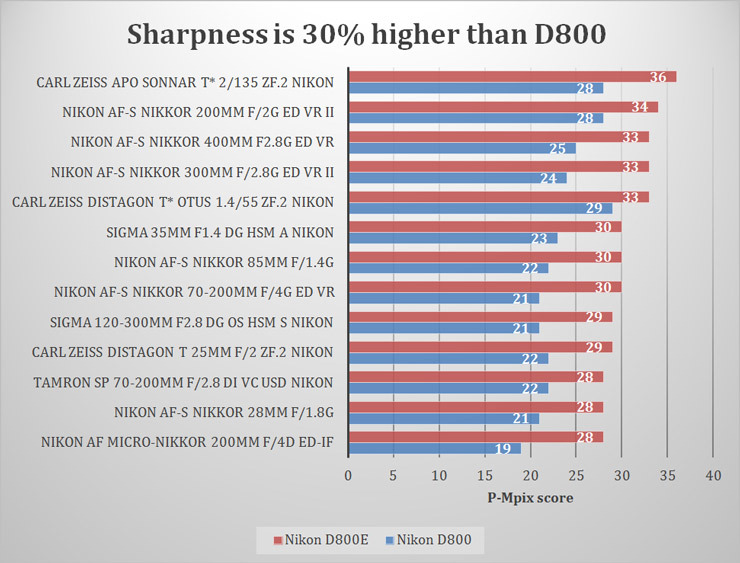 In fact peak sharpness is only 15% higher on the D800E. A similar increase was recorded with Nikon’s best performing lens the Nikkor 200mm f2.0 ED VR II. Other models with big gains include the critically acclaimed Art series Sigma 35mm f1.4 and Nikkor 85mm f1.4, the new lighter weight Nikkor 70-200mm f4G ED VR and the relatively affordable Nikkor 28mm f1.8G. While the big surprise was the slightly lower than expected sharpness score of the Zeiss Otus 1,4/55 it’s still the best performing lens available thanks to its incredible performance at maximum aperture. 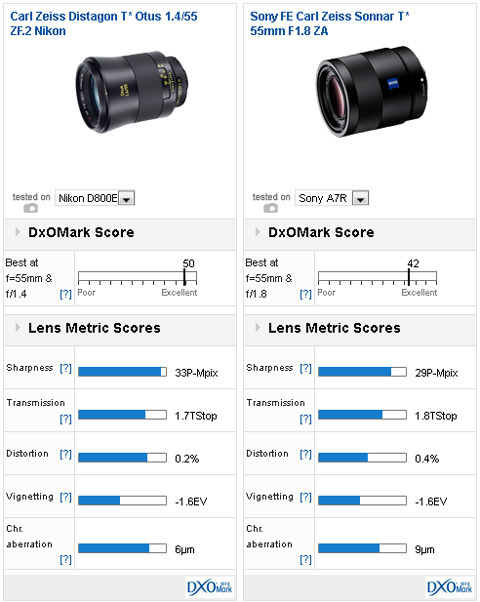 That heavily influences the overall DxOMark lens score, even if other metric scores aren’t quite as low as the Zeiss Apo Sonnar and the Nikkor 200mm f2. In fact the Otus is as sharp and as uniform at f1.4 as the Apo Sonnar is at f2, and at f2 it has slightly better sharpness and uniformity than either model. 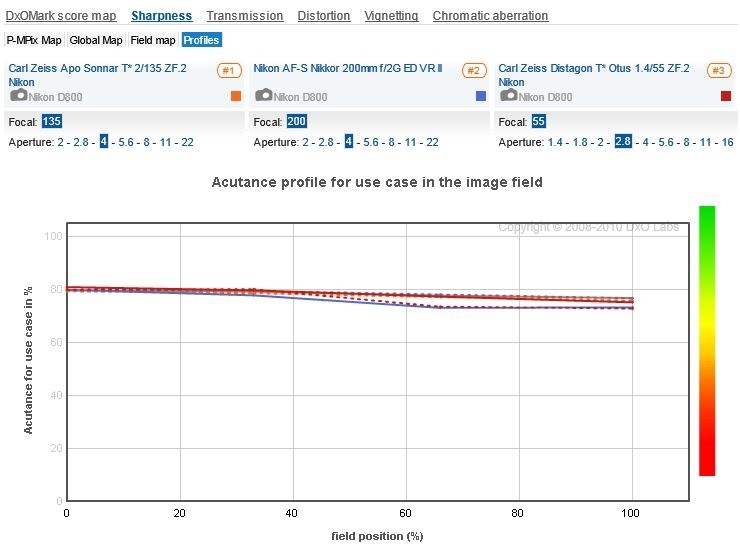 Optimum performance of the Apo Sonnar, however, is at f4, with gains over the Otus in the outer field, which accounts for the higher sharpness score. 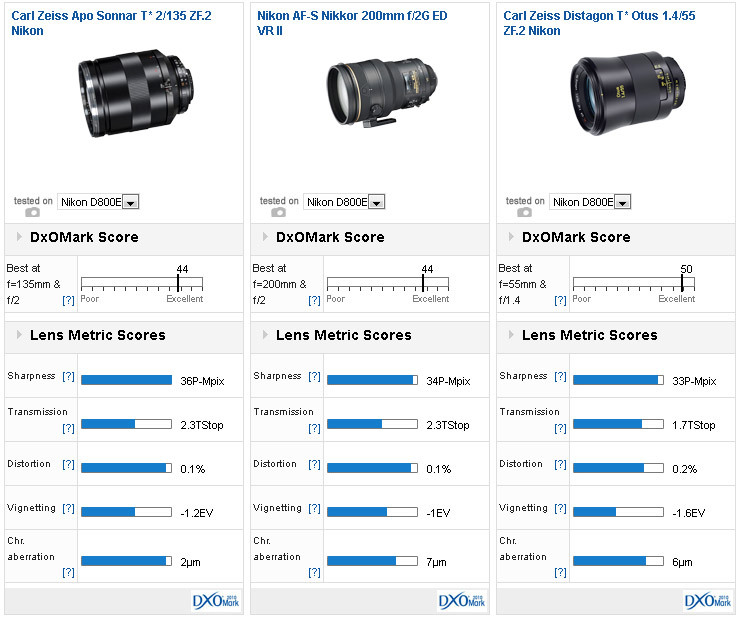 Optimum performance of the Apo Sonnar and Nikkor 200mm f2 is at f4 whereas the Otus peaks at f2.8, although when averaged the Otus had the higher sharpness across the field on the standard D800. The three sharpest models (as well as others at 33P-Mpix) exceed the maximum resolving power of the standard Nikon D800 sensor and are limited by the pixel count and AA filter, but that’s not quite the case with the D800E. The modified sensor in the D800E is capable of distinguishing between the very best performing lenses currently available. 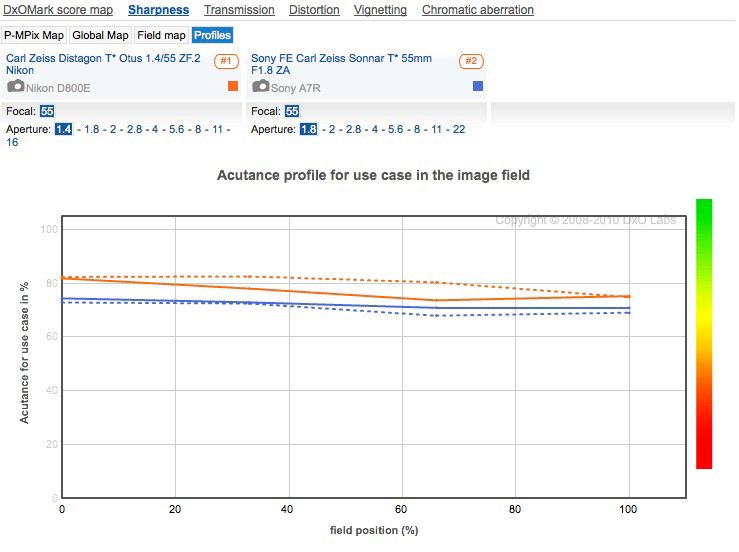 Significant gains in the centers and in the outer field of the three models are noticeable on the D800E, however now it’s clear that the Zeiss Apo Sonnar is sharper on average than the Otus at their respective optimum apertures. Despite that it’s also obvious that the three lenses are very close in sharpness, and it’s likely that all three are limited by the pixel pitch of the modified sensor of the D800E and are also likely to perform equally well on higher resolution sensors.